MIAMI, Dec 11, 2013/ — The daughter of designer Tommy Hilfiger, fashionistas know Alexandria as Ally, the celebdebutante, film and television producer and a reality show star. But, in the art world, she is known by her full name, Alexandria and has been named “artist to watch” at this year’s Art Basel showcase. And what a showcase it is! On Thursday, December 5, 2013 at the Riviera South Beach Hotel, Alexandria Hilfiger unveiled her newest body of work, “Melting Water”, presenting the modern collection at a private high tea. Accompanied by live jazz performed by the Greater Miami Youth Symphony, guests at the invite-only event were treated to the first look at Alexandria’s collection. The exhibit resided around the bamboo-lined, ground-floor pool at the Riviera South Beach Hotel, where it was placed on display for the following two days for viewing by hotel patrons. With studios in New York City, Berlin and Los Angeles, Alexandria Hilfiger confesses that she works very intuitively and spontaneously. 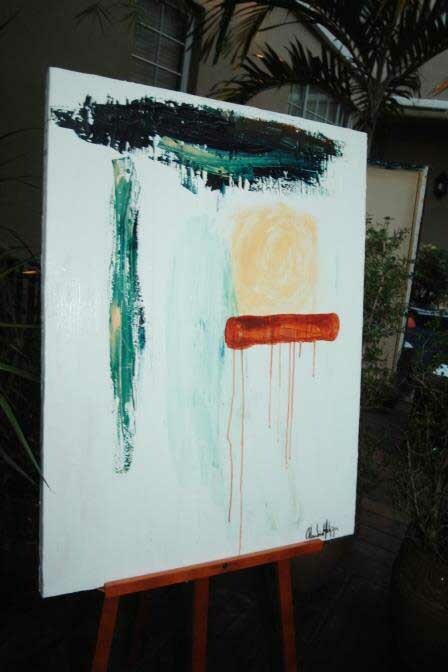 “Each piece is like a journal entry of my subconscious and emotions. Anything that I paint greatly reflects what I am lacking or what I need in the present moment,” Hilfiger said. Pieces were available for purchase, with a portion of the sale proceeds going to the Lyme Research Alliance—a non-profit organization to raise awareness for Lyme disease (which Hilfiger herself contracted 22 years ago). Among those in attendance of the exclusive viewing included fashion designer Tommy Hilfiger and wife Dee Hilfiger, singer-songwriter Lionel Richie, actress Gina Gershon, singer-songwriter Alex Young, artist Marc Quinn, singer-songwriter Mike deLease, DuJour Magazine’s Jason Binn, as if Magazine’s Tatijana Shoan, South Beach Group’s Alan and Nathan Lieberman, Früzen Ice and Bonito Mezcal CEO Hana Bisceglie and many more. Alongside a traditional high tea menu of finger sandwiches and a selection of baked novelties, guests sipped on a selection of beverages from sponsors Bonito Mezcal, Früzen Ice, Peroni Beer, Pamplonne, and Perrier® Sparkling Natural Mineral Water. Guests were also treated to an exclusive gift from RumbaTime, the Delancey, a unisex watch and the latest release from the popular NYC-based accessory brand, as well as cosmetics from Smashbox and magazines from as if.